New Deadpool .82 Code Just dropped. Specifically just for the Pro Model since that is all that is shipping at this point. So they added an adult mode awesome. pretty sure they added a more PG version and the current version is default of mature. Is there a bug thread yet? Found one. Me and a friend had a two player game going and I leaned onto the boom button and it restarted the game with one player. Thus was a location game with paid credits and we were on ball two. Darn that's a bit disappointing. Just tried to update to .82. Made it almost all the way through and failed. Hit retry and now all I get is “Unpack failed”. Redownloaded cide, sane size as 1st try. Copied files to two different USB drives. Same result. Have launch party on Friday so this is not good. Luckily we had a Stern memory card from another game and the update worked on that. Somebody needs to do more testing on the update code as a failed update should NOT brick the GD game. bjsilverballs I was having a problem w mine also. Do a "full install" and for verification(?) leave it as no. You may have to cycle all the way thru menu to get back to that setting. It was stuck on the install menu with the only choice being “Full installl”. No way around it. I looked on the memory card in the game that came with it and it already says .82 code on it. So I think I tried to update it with the code that was already on there and that is what bricked the game. Anyone know how to restore it? Now it just starts at the update screen asking for a USB. Are spike2 games able to except any kind of USB key now? I remember when you had to get lower USB version (1.0) with less than 2GB to get the code to update. Do USB 3.0 16GB USBs work? .84 code just came out. I’d avoid the .82 as there is a bug which can corrupt your code on update as it did to mine. Its in the new release notes, apparently the use case is if you turned on verify with your update. New code looks good tho! We managed to copy a good card image onto a random SD card so we had a good backup then got .84 installed. Skipping .82 is a good idea. Twice since updating to .84 the game has reset itself mid game. Never happened on previous versions. Happening to anyone else? Last night I had mine reset. It was mid game, ball trapped one right flipper and was using left flipper to show my bud info. The game lights went out (flippers still worked) then about 2 seconds later flippers died. Ball drained and game self reset. Updated code last night before a tournament and had a reset during the tournament. Every Stern game is known to have reset problems in its code developement. Save IronMaiden as I can't recall it ever reseting. A code update/patch will fix it like in the past. I’m not worried about it, just reporting so others know there game isn’t the lone weirdo if they have a reset. The team at Stern has already done a great job on delivering an awesome, fun for everyone, product. I know they’ll get it fixed up right. Yes, the 16GB 3.0s work fine on SPIKE 2 games. 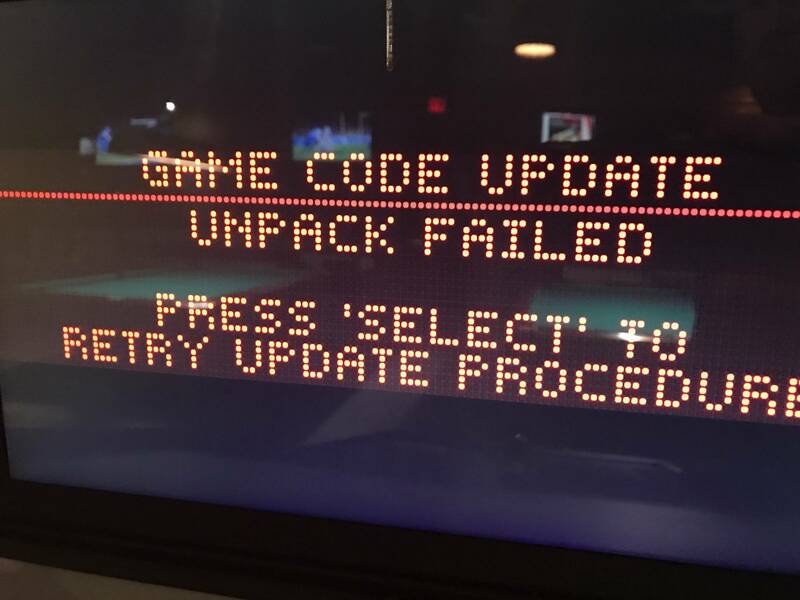 I've used them for several code updates at the Banning, Calif. Museum of Pinball. I've actually had a couple of issues getting USB 2.0 drives to work on SPIKE and SPIKE 2 pins. The 3.0s haven't failed me yet.